"Two worlds exist on this planet: the one we know...and the one below." There's an expected difficulty in adapting to a world that you're not really a part of. Difficulties arise from the natural inhabitants failing to understand what makes them so unique. There are some though who are determined to leverage the capabilities of those individuals and turn them into something more. People like some in Fathom: Blue #1 from Aspen Comics. The issue is written by Vince Hernandez, penciled by Claudio Avella, inked by Mark Roslan, colored by Erick Arciniega and lettered by Josh Reed. At this point in the Fathom universe, the core concept of a being from the deep living amongst humans isn't exactly new. Despite this, Hernandez still tries to infuse the story with a breath of fresh air, in that his main characters are all members of the Blue who have bee living alongside humans for a while now, eking out their own ways of life. There seemingly innocuous existence hasn't gone completely unnoticed, as there's one man seeking them out for their unique talents. Herndandez uses this as the basis for the series' direction, promising to offer a scenario where the group must band together in order to figure out what's going on and escape. The pacing is pretty even for a first issue, as each character is introduced and then shown within some context of one another. Fathom: Blue #1 has a very familiar look that fits comfortably within the Fathom universe. 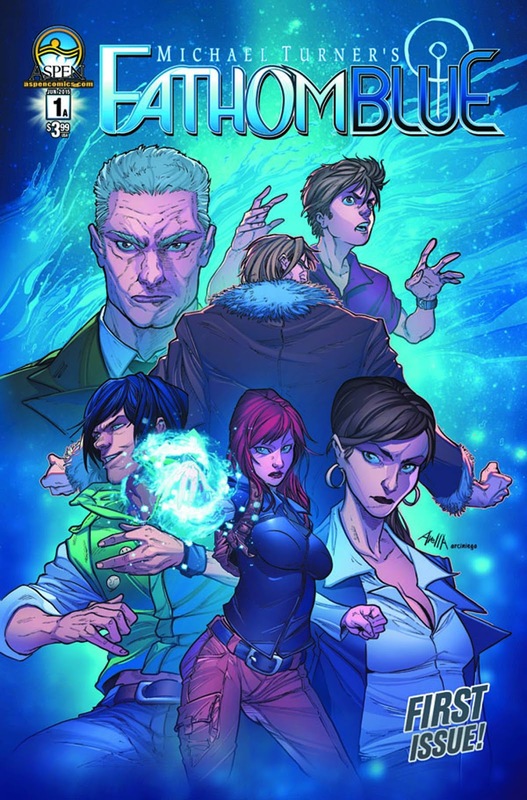 Avella's pencils render characters who look as if they could easily be Blue, teaming with Roslan's inks to emphasize character features with bold lines and outlines. It's the characters who carry most of the panels, as the backgrounds are generally pretty sparse in terms of establishing a setting. Much of Arciniega's colors skew darker, yet still manage to demonstrate a wide variety of different locations affected by various local environmental conditions. The gutters are black and further draw the reader's attention to the panels and their contents, framing each one effectively. Fathom: Blue #1 is a new entry in the Fathom universe and it looks to capitalize on the name "Fathom" as opposed to the character. The predicament the members of the Blue find themselves in at the end of the issue is unusual to them and requires some teamwork on their part, which makes the issue something of a team-up of sorts. The script by Hernandez is pretty easy to read and presented very cleanly, promising that the reader doesn't get lost in the shuffle. The art team gives the book a uniform feel that fits within the Fathom universe quite comfortably. Fathom: Blue #1 is going to garner attention from fans of some of the other works in the Fathom universe for sure. Fathom: Blue #1 is in stores June 17.